While there has been contradictory notifications on the requirement of Aadhaar card to obtain LPG subsidy in your bank account, LPG distributors all over have been mandating customers to complete the linkage. If you are one amongst those who believe linking Aadhaar number is fine/necessary you must read this. This can be done online through the by sending SMS or through IVR. 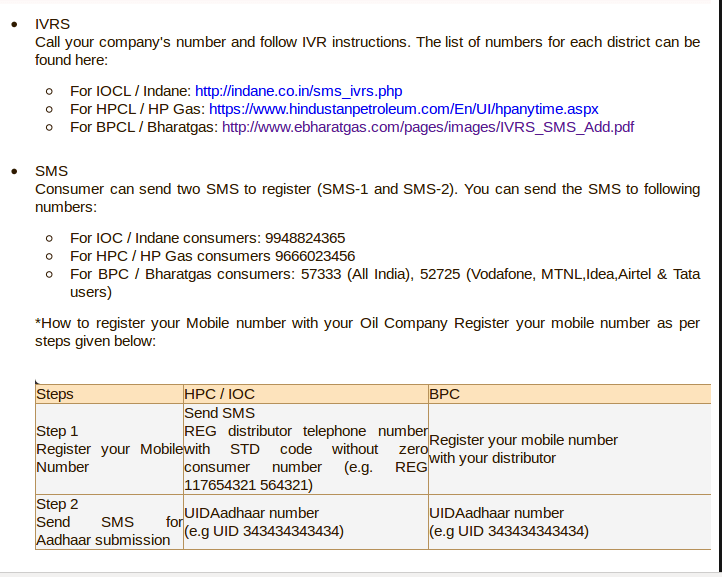 For SMS you can choose to use the number 51969 or use company specific numbers. Certain banks like Syndicate Bank, Canara Bank are allowing their customers to update their Aadhaar numbers online, either through internet banking or through dedicated webpage. Most of the major banks like SBI, ICICI etc. require customers to visit their branches with Aadhaar card copies and filled in application forms. However there is another user friendly way, i.e., USSD (currently on BSNL and MTNL only, majority of banks are allowing the service – NCPI List). So how did you seed your Aadhaar card to receive the subsidy from the Government and how was the experience? Let us know via comments.